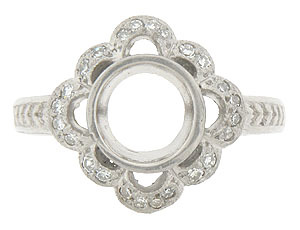 This platinum antique style engagement ring mounting is designed to hold a 2.0 carat round center stone. 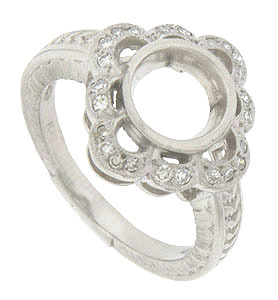 Swathes of diamond encrusted petals bloom from the central mount. Detailed organic engraving drapes down the shoulders and covers the rings sides. 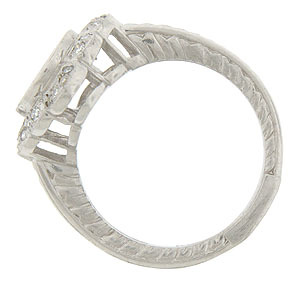 This gorgeous ring measures 15.52 mm in width. Size 7. We can re-size or reorder in other sizes. 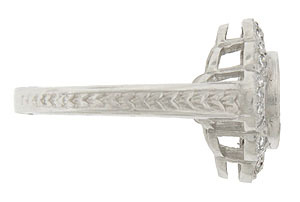 Also available in 18K, yellow and white gold. Contact us for current market cost.